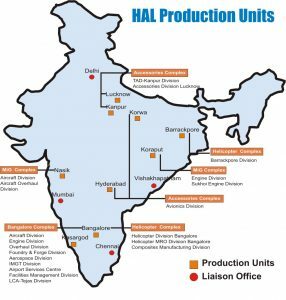 Hindustan Aeronautics Limited (HAL) is a Navratna company and the largest DPSU with has 29,035 employees, including 9,000 engineers 20 production units and ten R&D centres located in eight states. necma HAL Aerospace Pvt. Ltd.
Samtel HAL Display System Ltd.
HAL Edgewood Technologies Private Ltd.
International Aerospace Manufacturing Private Ltd.
Aerospace and Aviation Sector Skill Council. Helicopter Engines MRO Private Limited. Fighter Aircraft. Upgradation of combat aircraft is a continuous process to maintain the fleet's operational relevance. The newer multi-role combat aircraft will replace the present fleet in future. Future combat fleet will therefore be a mix of upgraded aircraft and high technology modern combat aircraft with swing role capability. Transport Aircraft. There is a need to enhance heavy lift capability of the Indian Armed Forces. Further, newer generation medium lift aircraft are required to bolster the transport capability and fill the void between LTA and HETAC. Build and sustain helicopter fleet to cater for the requirements of strategic and effect-based operations. VTOL hybrid aircraft will add flexibility and range while reducing response time. 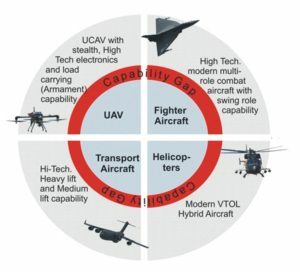 Towards capitalizing on the unique capabilities of UAVs in terms of persistent surveillance, an increased role is envisaged to be played through induction of High / Medium Altitude Long Endurance UAVs and ship based VTOL UAVs. The service needs to acquire additional UCAVs and have a balance fleet of manned & unmanned aircrafts for the future battle scenario. HAL's capabilities have come under the glare of public attention because of the controversy for allegedly government overlooking the interests of HAL. HAL's capabilities have come under the glare of public attention because of the controversy for allegedly government overlooking the interests of HAL. Performance of the DPSU can well be gauged by going through several reports of parliamentary standing committees report (2018) and the CAG reports of 2007, 2010, 2014, 2015 over the last decade and the common thread of all the findings was the DPSU inability to deliver on several fronts, time and cost overruns, defects and quality issues resulted in grounding and unserviceability of platforms for a long period, affecting the operational preparedness. HAL claims to be supporting the 75% of the Air Force's flying equipment made or maintained by them. While admitting capacity not the capability could be an issue, and are in the process of augmenting our capacity through vendors from producing eight aircraft a year to 16 a year. Despite of above, every time questions are raised such as to why to float competitive tender to Private sector for a Aero platform, why not nominate HAL. Moreover the Rafale controversy is currently playing with allegations of irregularities over contract costs, alleged crony capitalism and allegation of national interest being compromised for narrow political gains, especially before an election, causes much confusion in the minds of citizens. The political slugfest has created new awareness on DPSU functioning and may result intangible corrective measures on fixing their accountability. Some corners have also projected optimistic position on capabilities of HAL in fulfilling offset requirements. The fact of the matter is; Dassault had refused to take responsibility for planes made by Hindustan Aeronautics Limited (HAL), as the company “could not risk its global reputation” by partnering with the HAL. HAL has little to show in terms of delivery and accountability, altogether endangering, the air power dimension of national security. Even 71 years after Independence, India does not have an industrial base for designing and almost all aero platforms and major sub systems are being licenced-produced. HAL turn over has just been increasing at a normal inflation rate in last decade. In 2017-18 HAL recorded a turnover of Rs. 18,500 crore and the company has a order book over of Rs. 60000 crore as on date. The envisaged indigenisation level of 50% is yet to be achieved. There is a 3-year delay in delivery of Sukhoi-30, a 6-year delay in Jaguar, a 5-year delay in LCA, and 2-year delay in delivery of Mirage 2000 upgrade. The biggest delay is in making Tejas. Twenty of these jets IOC (initial operational clearance) version should have been delivered by May 2017, but the IAF only got 10. The situation on the helicopter front is no better. The delivery of 38 advanced light helicopter (ALH) Mark-III version and 16 copters of ALH Mk-IV version, contracted in 2007, were completed only last year, four years behind the planned full delivery schedule of 2013. Delayed upgrade of Forty-seven Mirage 2000 jets were to be upgraded at a cost of Rs 2,020 crore under the contract was signed in 2011. All variants of helicopters for three services. HAL right now, has the capacity to make 25-30 helicopters per year, which is not enough to meet the current demand of 1000+ helicopters in next 10-15 years. There are similar delays in Dornier transport planes and intermediate jet and HTT-40 basic trainers. Delays in the development of the HTT-40, a basic trainer as a replacement to the premature grounding of the HPT-32 owing to a spate of fatal accidents, led to the import of 75 Pilatus PC-7 basic trainers from Switzerland in 2012. The HTT-40 was originally scheduled to be ready for induction in 2015. Yet, the first prototype of this basic trainer powered with an American engine (Honeywell Garrett TPE 331-12B) was first rolled out only in February 2016 and first test flown in May 2016. The aircraft was expected to be inducted into the Air Force still remains a far cry. A recent review by MOD has highlighted that a Su-30MKI made in Russia cost Rs 269.77 core, whereas one made by HAL in India costs Rs 417.69 crore, almost “Rs 150 crore” more per aircraft. Similarly, there is a huge cost difference between the cost of the Hawk trainer aircraft manufactured by British Aerospace and those made HAL. Each Hawk aircraft manufactured Britain in 2004 cost Rs 78 Crore. Those manufactured at HAL would have cost Rs 88 crore that year. The cost Hawk aircraft produced by HAL continued to increase. In 2010, the cost shot-up to Rs 98 crore and in 2016, Rs 153 crore. The indigenous benefits of creating a ecosystem for the larger benefit of the country should be factored in the price but not at the cost of inefficiency and exorbitant overheads and man hour rates. As per the new defence pricing policy, the MoD has proposed to cut profit before Tax margins for all Defence PSUs to 7.5% on equipment orders placed on nomination basis in future as against 12.5% earlier. The margin for spare & services remain unchanged at 10%. The measure will certainly impact the profitability of HAL. The public confidence on business viability of HAL was reflected in response to its recent initial public offer (IPO) which just managed to scrapped through mainly due to response from the state-owned insurance agency and made a subdued debut by listing at Rs 1,152, a 5% below against its issue price of Rs 1,215 per share and presently quoted around Rs. 780. The principal reason why HAL was not allowed to licence-manufacture the Rafales was due to Dassault Aviation's refusal to stand guarantee for HAL's industrial QC/QA standards. Had HAL been forced to adhere to Dassault Aviation-specified industrial production standards, the total programme costs would have jumped to 4 times than what the GoI & HAL were then expecting. So, when the GoI was informed that HAL could only supply licence-built Rafales for which Dassault Aviation had no product liability, Let us not forget the IAF has over the past 4 decades suffered enormously due to HAL licence-produced aircraft not being covered by the OEM's product liability clauses. The issue of product liability & the terrible consequences of hardware not being subject to product liability coverage from the OEMs are not at all understood in Indian environment. No country can attain the military power by depending upon the imports for their crucial weapons and machinery. It needs indigenous capability to meet the requirement of its armed forces. There is a strong debate on indigenisation of the aircraft production. HAL, the only aerospace manufacturing entity in India with heavy order book over Rs 60,000 core almost loaded for over next three years. There are many projects in pipeline; it won't be able to handle the manufacturing of other aircrafts and helicopters. Therefore, we require more establishments hence; involving private sector can be another best possible option. At present, most of the private sector industries and SMEs are only engaged as suppliers, fabricators and designers to Defence Public Sector Units (DPSUs), accounting for 17 per cent of outsourcing. India needs at least 2 integrators in this segment, in addition to HAL. The “Strategic Partnership” (SP) model under 'Make in India” initiative to bring technology to strengthening its industrial base is in slow motion. Under the strategic partnership model for each of verticals single-engine fighter planes, helicopters, Indian firms will team up with foreign OEMs and bid for Request for Proposals (RFPs) on a competitive basis. The bid winner will manufacture the products and service them through the life cycle, locally creating jobs, and building infrastructure and indigenous capabilities. The tentative projections for projects under SP are about $1.5 Trillion. The working of sole monopoly of HAL needs to be scrutinized with on fundamental issues on technology, cost and delivery. Normally OEM will seek majority stake in the Indian JV and full control with 51% or higher equity stake mainly because of the imperatives of production management, quality assurance issues and for building a global supply chain. OEM needs to convince their suppliers to transfer technology to India and resolve the IPR issue. Indian private companies are ready to enter the aero space manufacturing in India but are hesitating to take step due to huge investment. Hence, the Government should take necessary steps to provide adequate support and assurance. It would create more jobs and help to improve India's GDP by contributing in exports after meeting the country needs. This could expose the ability of the Indian market to raise skills, lower costs and self dependability. The beauty of arms production in India has been its intertwined complications at technological, economic, structural, political and perceptional levels. In fact HAL and the DPSU have been surviving in such dynamics. The present controversy with allegations of irregularities in Rafale deal has been politicised especially before an election causes much confusion in the minds of citizens. The political slugfest assisted by some corners of HAL has brought more focus on capabilities of HAL in fulfilling manufacturing requirements. The impact of controversy will be more nuanced perspective on the changing military industrial dynamics in India. The working of sole monopoly of HAL needs to be scrutinized with on fundamental issues on technology, cost and delivery. More so with own in house aviation market forecast worth US$ 290 billion in the segment. HAL current situation is a cumulative effect of failed political leadership of DPSUs that's visible across the spectrum of PSUs in our country. There is no doubt that HAL and in fact all DPSU needs some major restructuring and introduction of accountability if it has to play a more meaningful role in India's quest for self-reliance.